No need to carry a shopping basket with these convenient mini grocery shopping carts. 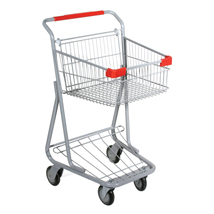 These shopping carts are lightweight and easy to maneuver with the 5 in. soft-runner wheels. Mini grocery carts allow customers to purchase more because there is no weight to carry around. Weight capacity is 75 lbs. in the basket. 12 carts nested take up only 2 ft. wide x 9 ft. long. Gray frame with red handle. Basket size 19 in. W x 11 1/2 in. D x 17 1/2 in. H. Height is 38 1/2 in. from the handle to the wheel. Also great for warehouses, personal, apartment and condo use. For even more items, we invite you to take the opportunity to view our comprehensive range of shopping carts at Specialty Store Services now.